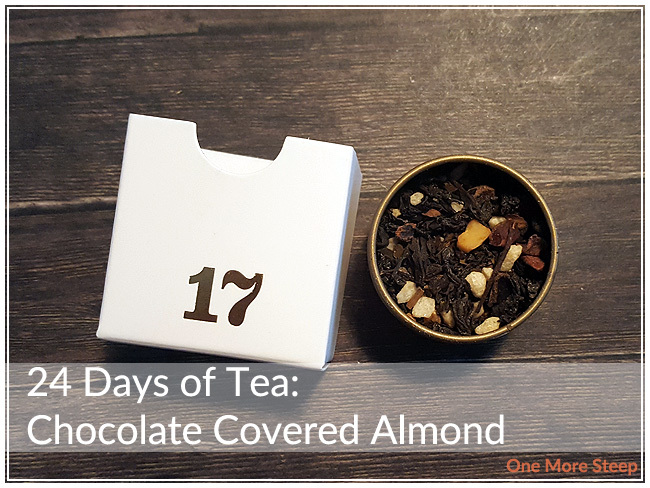 The name of day 17 of the 24 Days of Tea calendar shares its name with a tasty snack – Chocolate Covered Almond! The tea smells like you’d expect – I can smell chocolate and I can smell almonds, so already the dry tea is a win in matching the fragrance to what I expect from the tea. I was half expecting this one to be a fruit/herbal infusion, but it’s actually a black tea and yerba mate blend. Definitely not a tea that you’d want to have late in the day or before bedtime. Chocolate Covered Almond is made up of: cocoa nibs, roasted carob, black tea, almonds, yerba mate, sugar, natural and artificial chocolate and cream-almond flavouring. Like most of their black teas, DavidsTea recommends steeping Chocolate Covered Almond in near-boiling water (90-95°C/194-203°F) for 4 to 7 minutes. I steeped mine for close to 4 minutes. On first glance, Chocolate Covered Almond has a beautiful golden orange liquor. 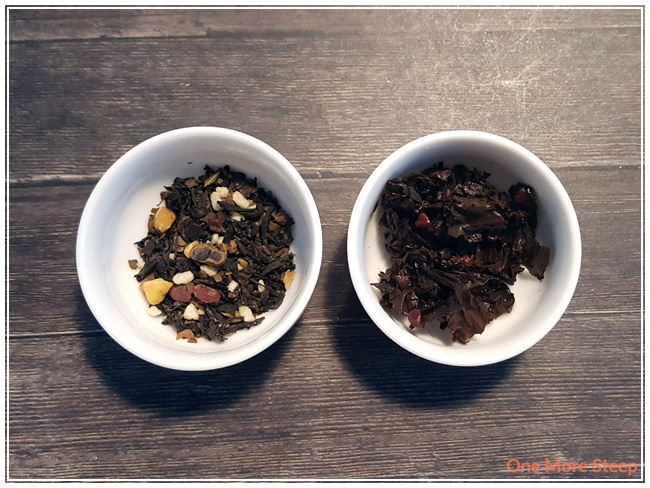 The smell that first comes to me is the malty tones from the black tea base – yum! 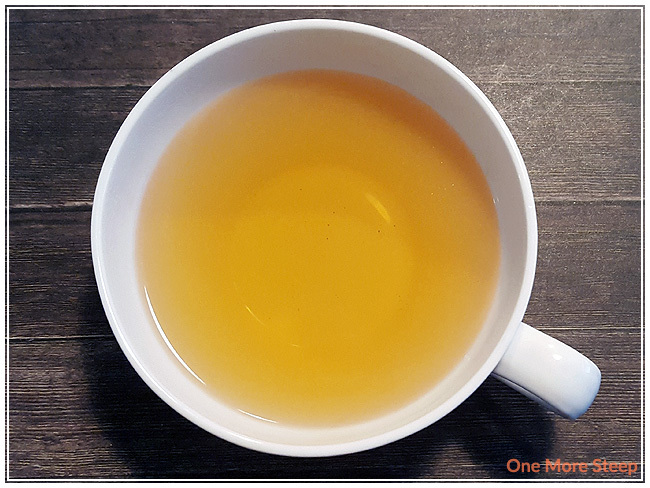 There is a thin oil film on top of the tea, from the chocolatey ingredients in this tea blend. There is a pleasant mouthfeel with the oil though, it’s thin enough that it isn’t overwhelming or completely coating the mouth. I can taste the almonds, and some of the malty flavour of the black tea. I can smell more chocolate than I can taste. The chocolate flavour is watered down. There this almost alcoholic taste to the tea as an aftertaste, and I’m not quite sure how I feel about it just yet. I thought that DavidsTea’s Chocolate Covered Almond was just okay. It didn’t quite remind me of chocolate covered almonds, but I wish that it did. There’s the watery chocolate flavour and the almonds are there, there’s just that odd alcoholic aftertaste to each sip that I don’t quite enjoy too much. I think this tea would benefit from having a little bit of sweetener and perhaps some milk. 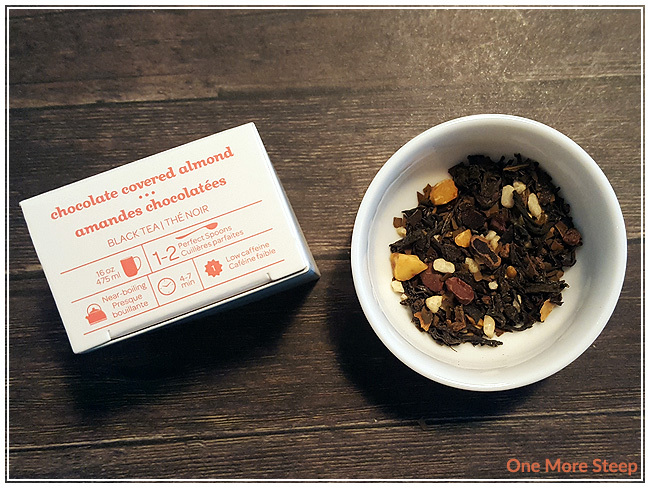 Milk would add some creaminess that you’d expect from a chocolatey tea, and probably help with bringing that chocolate almond taste to the forefront in the flavour profile of each sip.